To begin understanding fractions, this lesson introduces you the basic ideas behind fractions. You can proceed by reading the study tips first or watch the math video or try out the practice questions. 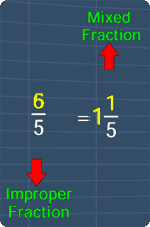 Now, the above expression can also be written in the form of fraction as shown in the picture on the right. Notice that, the fraction is divided into 2 parts. The upper part is the numerator and the lower part is the denominator. Note that, an improper fraction can be changed into a mixed fraction and these two fractions are equivalent. The difference is only at the way they are written. The picture on the right illustrates this. The math video below will explain more on this. Understanding Fractions from MathExpression.com on Vimeo. This lesson shows you basic ideas behind in understanding fractions. Let's say that we are given the expression, 2 divide 5. Now, we should know that, 2 divide 5 can be changed into the form of fraction, which is, 2 over 5. In this form, the upper part of the fraction is called, numerator, and the lower part is called, denominator. Now, since the numerator is smaller than the denominator, this fraction is a proper fraction. Next, let's try to understand what does fraction means. To do so, consider this long piece of bar. When the fraction has a denominator of 5, this means that this bar is divided into, one, two, three, four, five small equal parts. When the numerator is 2, it means that we selected 2 out of 5 parts of the bar, shown by the yellow colored parts. Now, when we increase the numerator to three, four, five, observe the number of the yellow parts increase as well. Here, notice that the numerator, and the denominator, are now the same. This kind fraction means that, we are dividing 5 with 5, which gives 1. We can visualize this by seeing the entire bar as 1 yellow piece. 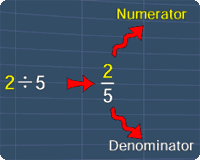 Let's examine further, when we increase the numerator from 5 to 6, the numerator is now greater than the denominator. 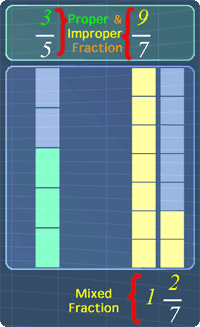 Here, we can visualize the fraction, 6 over 5, by seeing this yellow bar as 1, and the next bar has 1 of the 5 parts as yellow. Now, let's further elaborate this fraction. By now, we should know that 6 over 5 is the same as 6 divides 5. Also, from what we have seen here, 6 over 5 is also the same as one, one over five. The next thing that we should know, since the numerator is greater than the denominator, this fraction is an improper fraction. Also, when 6 over 5 is written in this way, this fraction is called a mixed fraction. Alright, let us continue to increase this numerator . Observe how the improper fraction and mixed fraction changes. The improper fraction, 7 over 5, will have the mixed fraction as 1, 2 over 5. The improper fraction, 8 over 5, will have the mixed fraction as 1, 3 over 5. The improper fraction, 9 over 5, will have the mixed fraction as 1, 4 over 5. The improper fraction, 10 over 5 is the same as 10 divided by 5, which gives 2. The improper fraction, 11 over 5, will have the mixed fraction as 2, 1 over 5. Alright, that is all for this lesson. Try out the practice question to further your understanding. You can start by going through the series of questions on understanding fractions or pick your choice of question below.